Tomorrow Jon and I are going to our good friends' little girl's 1st birthday in Dallas. It is a garden themed party, and I've heard about and seen some of the decorations and party ideas and know it will be absolutely adorable affair. Birthdays are a big deal. It's amazing to see just how much a child can grow in a year. The people of marthastewart.com must have thought they same thing because they came up with this great idea. 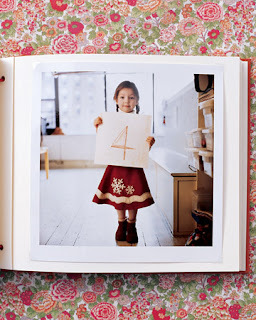 Use a scrapbook or album to hold pictures of your child posing on his/her birthday each year. The kids can decorate their own signs showing the age they're turning (except when they're really young of course). Eventually, you'll have a book full of photos documenting their birthdays and growth over the years. It is recommended that you have your child stand so you can noticeably see their growth. It's such a cute tradition and easy to do keepsake! I'll definitely be making one for my kids in the future!